So the Incredibiles finally gets a sequel? 15 years too late. (Yes, I know its 14 years since the first movies, but you have to say 15 yeas for the joke to work.) Appropriately, we the audience had to wait for a decade and a half, the same length of time in story that superheroes have been outlawed. And once again Brad Bird steps up to the plate as both writer and director to take us in the next chapter of the Parr family. The story picks up immediately where it left off, with the Underminer attacking the city, robbing the bank and fleeing, while the Incredibiles and Frozone stem the damage caused by the rampage. The Incredibiles are arrested and blamed for the destruction, and afterward are returned into their life in hiding. Bob and Helen meet with Lucius, who brings them to meet Winston Dever and his sister Evelyn, sibling duo CEO’s of Devtech, a telecommunications giant. 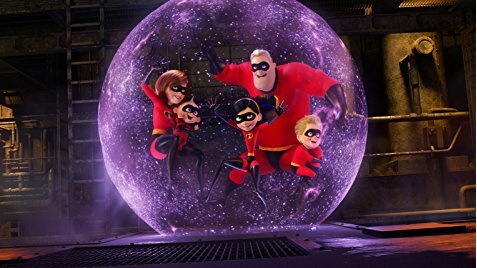 Winston and Evelyn want to bring supers back into the limelight, sponsoring Helen as Elastigirl to live stream her crime fighting heroics to change public perception of superheroes, while Bob and the kids, Dash, Violet and baby Jack-Jack, and move into a new home provided for by Winston. While Bob makes the transition to stay at home dad, having to contend with Jack-Jack’s myriad of superpowers, Helen saves a runaway hover train and learns of a new super villain who has her in their crosshairs- the Screenslaver. The Screenslaver is an interesting villain, while no Syndrome, still has a philosophical monologue which lends itself to some very Meta moments. In fact The Incredibiles 2 might just be the most subversive superhero movie in recent memory. Another example is how Evelyn and Helen pass the Bechdel test- a rarity in a movie rated PG and marketed towards children. Speaking of which, as Bob shows, and Edna reminds him, being a good parent is just as important as saving the day, just as heroic as anything. There great character drama and beautifully animated action sequences, it makes the wait worth it, just hope that Brad Bird doesn’t wait another ten years to show us what happens next to the Parrs. This entry was posted in Blog and tagged 2, animation, incredibles on July 31, 2018 by SETV.